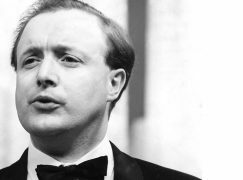 The Welsh tenor Kenneth Bowen, bearer of the above accolade, died yesterday in Cheltenham at the age of 86. A busy oratorio singer in the 1960s and 1970, ranging from Handel to Schoenberg to Tippett, he became Professor of Singing at the Royal Academy of Music in London, where his students included the broadcaster Aled Jones and the bass-baritone Neal Davies. He recorded extensively. His son Geraint is co-artistic director of the Three Choirs Festival. His son Meurig is former director at Cheltenham. Our condolences to the family. A fine, fine singer and a wonderful musician. My deepest sympathy and condolences to Geriant, Meurig and to Kenneth’s family, to his friends and his many grateful colleagues. He also sang with Welsh National Opera. By the way Norman, bad grammar. It’s always Wales’ Never Walesus!! BTW Wales’ and Wales’s both acceptable in British English! Can’t vouch for any other kind of English. And Keeping Up with the Jones’ not Jonses! Rest in peace Kenneth Bowen – an inspiring singer and teacher . He will be remembered with much affection. Condolences to his family. It’s “Joneses” – plural, not possessive. And the choice between Wales’ or Wales’s, at least when it comes to publication, is purely a matter of house style. No right or wrong about it. A wonderful musician and singer, and very generous to the singing students at the London College of Music, when I was there. Very much missed. I well remember him coming out of retirement at very short notice to sing the taxing tenor part in The Dream Of Gerontius, and doing so effortlessly and flawlessly. I still listen with great admiration to his performance as the Hotel Manager in Britten’s Death In Venice. In addition to his fine vocal technique and musicianship, he was a wonderful human being, gentle and kind. He was a very fine Gerontius, usually singing it without the book. I remember particularly a RFH performance in the 1980s: calm, committed, and a million miles away from the typical ‘oratorio tenor’ attitude, with one foot slightly withdrawn! He was bearded at the time, which aided verisimilitude. And, yes, a very nice man, who I knew in connection with the Association of English Singers and Speakers, tolerant of my usually catastrophic attempts to announce myself on the telephone in Welsh (‘Noswaith dda, Kenneth; Gareth Hymfris idw i’ … oh, dear!). His conducting of the London Welsh Chorale was also memorable – and distinguished. Gorffwys mewn heddwch, Kenneth.